Looking for something to make your event that much more memorable? Want to know what has everyone excited in the catering industry this year? Look no further – read on to discover the top five catering trends for 2018 right here. When it comes to conferences and meetings, time is precious. When there’s a lot on the schedule to get through, there’s not always enough time for people to sit down and get a full-service lunch in. That’s where ready-made grab and go lunches come into play. Pick-me-up bags with pre-determined meals can ensure that everyone gets something to eat, but in a way that’s most convenient for them. The great thing about this popular option? It’s extremely customizable! Another big trend on the rise this year is holiday meal catering. More and more families (and businesses alike) are opting out of cooking over the holidays and are instead choosing to have a full turkey dinner catered right at home or in the office. This lets everyone sit down to a delicious meal without the stress of organizing and cooking for the entire group. Catering companies have also been noticing an increase in the number of corporate businesses that are skipping the offsite events and are celebrating the holidays with more lavish office parties. A full turkey dinner is a perfect way for corporate teams to celebrate together without breaking the budget. It’s not uncommon for people to travel to get to your event. And, while they’re in town, they will likely want to see what your area has to offer, including the local cuisine. Destination-specific menus are an easy way to impress your guests and show them the culinary highlights they can experience in Canada (and more local areas), like Alberta prime rib beef and apple crumble pie (and of course real Quebecois poutine). Not all catering events are situated around office tables and six-course menus. When guests are encouraged to mingle and network, grazing tables that offer delicious antipasto platters, hot and cold hors-d’oeuvres, express sushi bars, and carving stations are a choice which will encourage sociability. Nothing is worse than having a food coma during a big meeting. That’s why ultra-healthy menus are a hot catering trend for 2018! 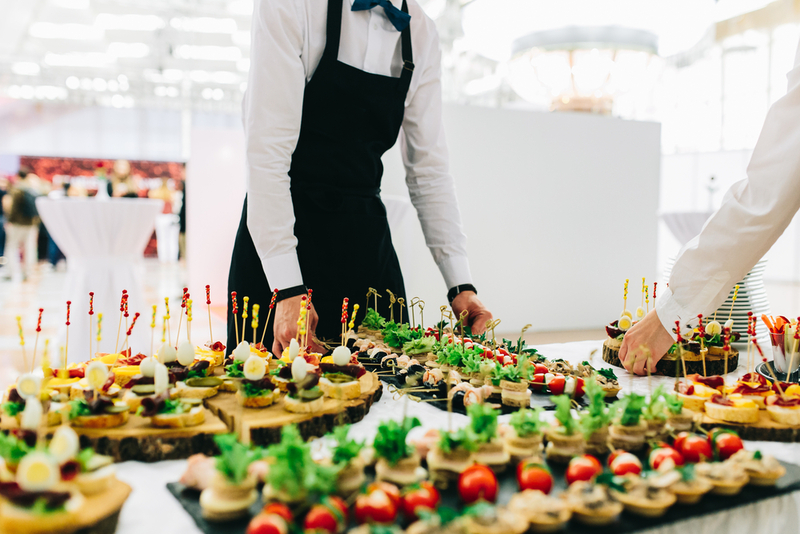 Foods that are delicious while producing enough brain fuel and energy to push through an event are among the most popular catering requests this year. When you’re ready to give one of these catering trends a try, check out our menus at Centurion Conference and Event Center. We offer express catering to your home, event, or business, as well as onsite catering at our award-winning conference centre. To see our menu click here or talk to one of our event managers directly at 613.727.1044.